Wow. Take that all into account and it seems we are due for another reset.. And it's a shame because I feel we were finally close to escaping this rock. Just keep an eye out for the elites disappearing from public view I suppose. its a web site that is a lot better than ATS. so where is the visual evidence? Well, the seafloor is somewhere around 3000-4000 meters down where the hypocenters are located. They measure the speed of the seismic signals and they're able to determine the approximate location and shape of the magma plume; the speed of seismic signals is affected by the presence of magma. They looked at the seismic data and determined that there were many smaller earthquakes which were embedded in the long period event. Several low frequency tremors(e.g. Tab. 1) have been recorded. The largest one, on November 11(Fig. 9), recorded worldwide, awaked the interest of the seismological community and the media. None of those tremors is triggered by a strong earthquake, but there are earthquakes embedded in all tremors and all start with moderate and high frequency events. The above description fits perfectly with an injection of magma from below. The magma breaks, displaces, and melts the rock above it which produces the long period, low frequency tremor along with co-seismic smaller events in areas in which the magma is moving. It will seek the path of least resistance and follow existing fault lines or softer rock. So far, they do not think it has breached the surface of the seafloor and all of this is happening at depth. 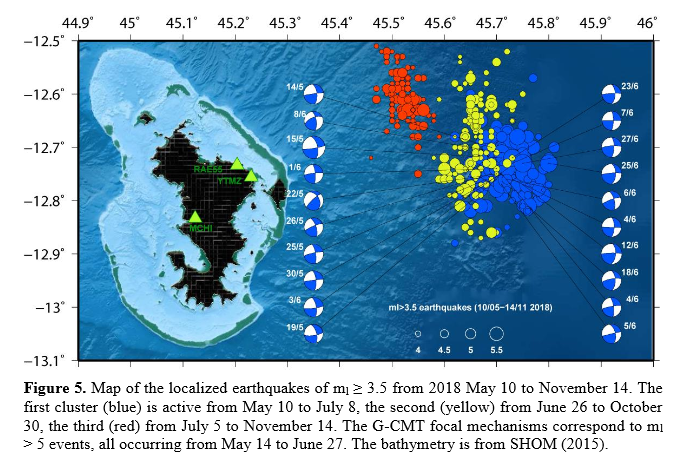 There has been enough deformation and movement discernible from sensors that, along with the aforementioned seismicity, add to the conclusions that there is an underwater volcano forming off the coat of Mayotte. They don't have enough instrumentation to make a more refined analysis just yet, but from what they have learned, there does appear to be a sizeable intrusion of magma from below. The magma was moving from right to left in this image as can clearly be seen when you look at the time series, blue, to yellow, to red. Further study, including updating the bathymetry, will tell them more.